Located at Mövenpick Hotel Karachi, Imperial Spa & Health Club is the first of its kind beauty and fitness facility that offers a state-of-the-art Spa & Health Club to its guests and members. Mövenpick Hotel Karachi, being the only internationally managed hotel in the country, has always tried to offer its guests upscale services that match international standards. Same was the inspiration behind the newly renovated Imperial Spa & Health Club. Imperial Spa & Health Club has been thoughtfully created after thorough research in order provide an exceptional experience of high-end services with international standards. 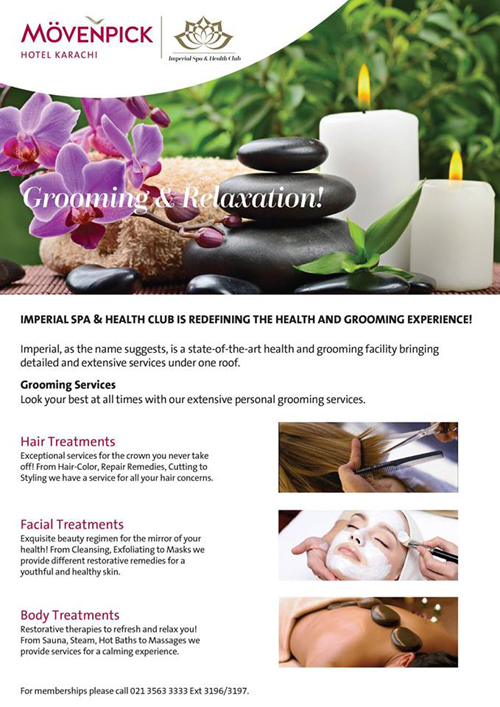 Imperial Spa & Health Club offers detailed and extensive health and grooming services in one elegant and uplifting locale. The facility has separate spaces for men and women. The highlight of Imperial Spa that it provides personalized and tailored services according to each guest to create a unique experience for everyone. Imperial Spa & Health Club has been designed by an international architectural firm to give a unique look to the facility so that it stands out from the rest in the city. Imperial has world-class technical fitness equipment specially imported for the guests. Spa and massage therapies are offered by trained international professionals making their debut in Pakistan. Imperial has partnered with international brands providing spa products for its services. As Imperial Spa & Health Club has been established on international standards, it has associations with international fitness gurus and spa brands. Professional masseuse and masseur from Philippines and Thailand have been hired to provide spa therapies. World-class fitness equipment has been imported for the gym. Natural products from acclaimed spa brands such as Spa Ceylon has been used in all the treatments. Exquisite beauty regimen for the mirror of your health! From Cleansing, Exfoliating to Masks we provide different restorative remedies for a youthful and healthy skin. Restorative therapies for the place you live in! From Sauna, Steam, Hot Baths, Cold Baths to Massages we provide services that relax and rejuvenate you. Maintain your vigor and strength through the fully equipped gym having the latest equipment and additional facilities. 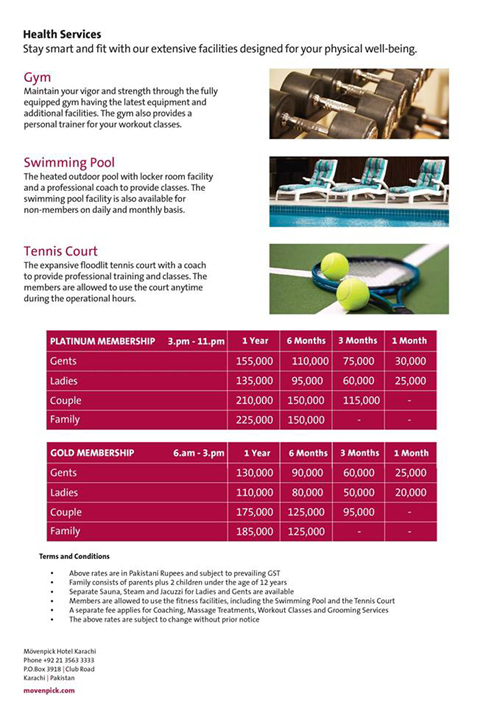 The heated outdoor pool with locker room facility and a professional coach to provide classes. The Turkish Bath has been of great attraction to the guests which is built in a combination of beautiful blue and brown marble to promote healing and tranquility. Turkish Bath provides 90 minutes body scrub and massages with Spa Ceylon products. The elegant aesthetics give a regal look to the facility, creating a luxurious and peaceful ambiance. The comfortable and friendly assistance enhances the experience. The incomparable services from trained international professionals make the spa a premier choice in the city for discerning clientele. The spa has been built on modern lines, creating a perfect amalgamation of contemporary and traditional ambiance to provide relaxation to guests. A combination of chic ornaments, abstract paintings and stylish built provides a luxurious experience to the guests. Imperial is committed to provide a novel affair to its guests, redefining the grooming experience. The facility has recognized the needs after a thorough research to offer matchless services to its clients. The highlight of imperial is personalized and tailored services according to each guest to create a unique experience for everyone. Imperial welcomes all its guests for a relaxed and fine experience in an affordable range. Avail the finest health and grooming services that you can possibly imagine at the first of its kind facility, exclusively at Imperial Spa & Health Club. 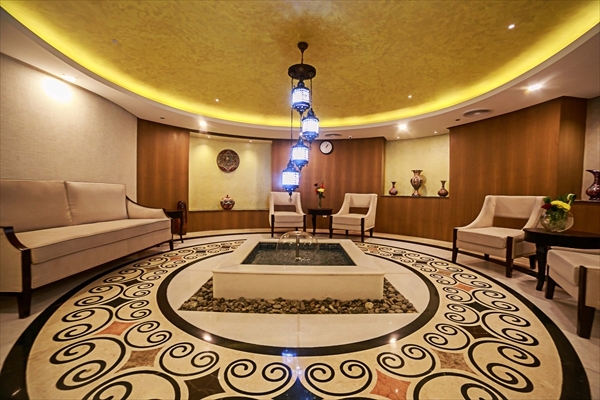 What to Expect: An exceptional experience of high-end spa services offered in an upscale and friendly environment.